Single door antique French armoire C1900 finished in Grand Illusions 'sel de mer' with gold highlights and a clear wax finish. 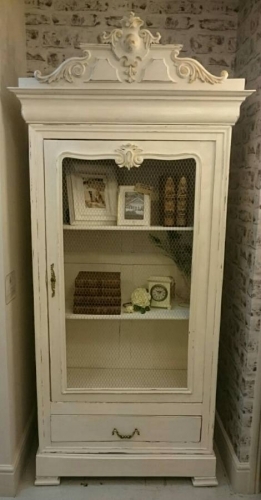 The door to this armoire features chicken wire and the interior features adjustable shelving, which makes for ideal kitchen storage or a quirky book case. Perfect for contemporary and vintage inspired lifestyle homes. Please contact the shop on 01604 713227 if you are interested in this item. We have a wider selection of Armoire's available not shown here this is due to them not all being painted or finished to the standard to whcih we would like to present them, however they are available to purchase and can be bespoke finished to fit with your room - please enquire.